“When planning our trip to Italy to attend a wedding, my one thought was I wanted just one day of our 23 days there dedicated to bird-watching in Italy and a birding guide who was experienced and could lead us to bird watching spots. I wanted someone with whom we could maximize the most species for a day. After researching I chose the Po Delta and came up in several searches with Menotti’s name. I emailed and plans were set in motion to meet up. When we arrived in the Po Delta the night before our day of birding with Menotti Passarella we were blown away by the beauty and culture of the Delta. I knew this was going to be a trip of a lifetime. Menotti connected with us at our hotel that evening and we arranged to meet at 8 AM at our hotel, in Santa Giulia. Right on time the next day we started our day of discovering the birds of Italy. 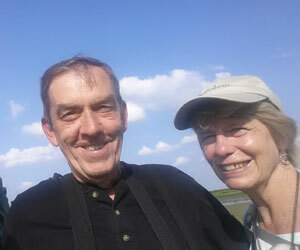 We drove just a short distance before we heard a Reed Warbler calling in the marsh. Before 9 AM I am sure we had over a dozen new life birds including a Pygmy Cormorant and a European Shag. As the day progressed the species list grew as did Menotti’s enthusiasm over each new bird for that day. Great Crested Grebe, Northern Lapwing, Red-footed Falcon, Squacco Heron, Purple Heron, Collared Pranticole and on and on up to 85 species. The birds of Italy are so unlike our American birds. It was a special treat. Menotti took the time to explain the natural history of any species that may have been or is currently a species of concern and its nesting and breeding habits. My passion is conservation of all wildlife, especially birds so I thoroughly enjoyed that. He would tell us how conservationists in Italy had worked to bring that species numbers back into the safe zone, as in the case of the Cetti’s Warbler. We were treated to sightings and the enjoyment of the song of the Cetti’s several times throughout the day. As we traveled the back roads of the Po Delta we added species by the hour to the list, only missing a few he thought we could find at a location. Near the end of the 11th hour we were treated to the Greater Flamingos and a lone Lesser Flamingo among the hundreds of Greaters as the sun set over the Delta.